There are no boundaries to Hilary’s Duff talent. She is well known as a pop style singer, who can boast by three platinum albums. She is deemed to be a gifted actress, designer and couturier, the author of several fashion lines. Hilary is also an executive producer and the lead character of various films. Besides, she is known as a good writer. So many talents are united in only one personality! Hilary Duff differs from the other celebrities by her unexceptionable style. She doesn’t work with a stylist and creates her looks by herself. She always adds charm to her look with the help of various accessories and can boast her unerring taste. 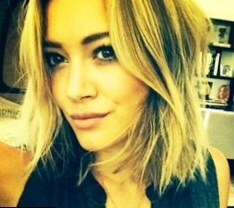 Hilary Duff can be included into the list of Hollywood celebrities who likes hair changes. It is obvious that from time to time a person looks for some changes and usually starts them from the hair dress. Hilary is a visible example. She is a pretty and fascinating woman.She is considered to be a woman, who likes experiments with her style. 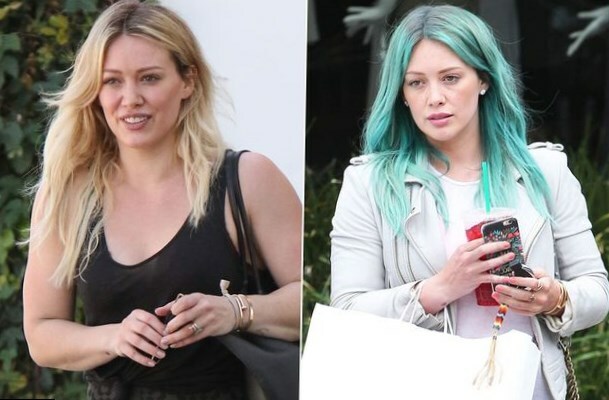 Hilary’s Duff spirited features allow her to colour her hair either in dark or fair hues. Hilary frequently lets her long hair down and has her hair waved or straight. The celebrity likes the fringes. By the way, this woman always looks perfect and at any party she has ideal make up and hair dress. In casual life she can be noted with either straight and unfastened hair or with a pony tail. Until more recent time she prefers to stay blond but dark colours also feat her greatly. Last year before summer Hilary cut her hair short and wore bob. From the back her hair was short and a little bit longer in front. The actress wasn’t ready to such drastic changes but they were necessary in order to cut the split-ends. Finally the actress liked her new hair style and felt comfortable with it. But a month ago Hilary also astonished her admirers by her new stunning hair colour. Her hair was coloured into green-blue hue. For a long time neither her relatives nor friends could understand such changes but later Hilary explained. The point was that when she was away on vacation with her son she sat on the sea shore and suddenly the desire to have the same hair colour as the ocean had appeared. Later she added that earlier she never had the same feeling.With that colour she really reminds a mermaid. It ought to be remarked that her new look was surely appreciated by her son Luka, who liked mother’s experiments. The fabulous mother’s look impressed him greatly. By the way such experiments with hair style didn’t satisfy the woman so just two weeks later she shared her photos with a new hair color. Now Hilary Duff has her hair colored into pink and grey locks. It seemed to be that the celebrity decided to try all the colors of the rainbow. What has inspired her on such changes we don’t know but such hair color will certainly bring more attention to the celerity.